There is no substitute for an engaged, healthy email list. While I obviously LOVE social media, your email list is one of the few properties you actually own online. It is your real estate! With Facebook increasingly limiting our access and exposure to our fans’ newsfeeds, funneling your social media audience into your email list is more important than ever. Remember: No one can restrict your access to your email subscribers! So, how do you convince your Facebook fans to become email subscribers? 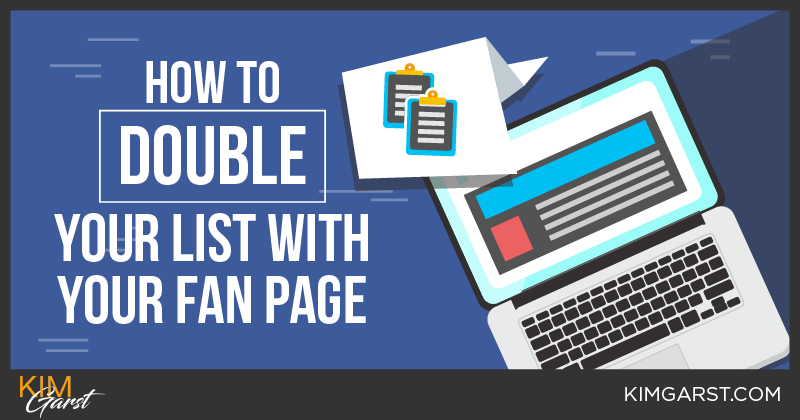 Here are 6 strategies that will help you double your email list using just your Facebook fan page! One of the best ways to acquire new email subscribers is by holding a contest on your fan page. In fact, 35% of fans like Facebook pages just for the contests! By making leaving a valid email address a contest requirement, you can increase your subscriber base substantially. Just make sure that entrants understand they’re being added to your list, otherwise you could end up with a bunch of email spam reports and/or disgruntled subscribers! I recommend you use Heyo’s Free Giveaway Builder for this. A recent Heyo customer, Squaw Valley, ran a Facebook contest that captured over 4500 email addresses in under 10 days. This more than doubled their email list! Another business, Nicolette Island Inn, captured 25% of all their fans email addresses using the Heyo Contest Template which asks users to enter their email, then click “like”, “share,” and “tweet” for their chance to win. One of the best aspects of Heyo is that with every contest you build, they automatically make it mobile-optimized and even provide a smart URL for you to use in your marketing. Click here to start Heyo’s free trial, it’s a great way to get started towards doubling your email list! If you have an info product you give away to new email subscribers, be sure to let your Facebook fans know about it. You may also want to consider coming up with a new product JUST for your Facebook fans. This could be an E-book, whitepaper, report, podcast, webinar, or any other low-cost product that provides value to your audience. Offers are a great strategy for getting your fans to ‘claim’ a discount or coupon (Did you know that 42% of fans like a page for the discounts and coupons?). You can also use offers to give away your free info product (see #2 above). While you can also promote these via your status updates, using offers gives you an added benefit: those who ‘claim’ your offer get an email with details of the offer. This gets your name and business in front of them – not just on Facebook – but in their inbox as well. While you don’t get access to their email address at this point, you will want to make sure you collect emails on the signup page people are sent to when they claim your offer. A smart strategy I have seen used recently is to poll or survey your Facebook fans, compile and summarize the results, and then offer the results in a free, downloadable report with signup. Just be sure to offer it to current email subscribers as well! You likely already use your fan page to drive traffic to your website or blog, but the vast majority of these visitors won’t bother signing up using the little opt-in box in your sidebar. This is why it’s important from time to time to direct your fans to a dedicated opt-in page on your site. You can use this page to offer a free info product (see #2 above), or you can simply promote the fact that you’ll be providing valuable information via your emails. If you are going this route, it really helps confirm the value of your free offer if you use testimonials from happy subscribers. Most major email service providers will have an app that allows you to collect emails right from within your Facebook page. These apps will let you have a fully functional email opt-in form, and your fans will never even have to leave Facebook. Your fans will simply need to click on the tab underneath your cover photo to access the form; as always, it’s a good idea to offer something of value here rather than just asking your fans to ‘sign up for your list’. Your Facebook fan page is one of the best ways to covert your social media followers to email subscribers, so don’t be afraid to experiment a bit to see which strategies work best. Your efforts will pay off in the long run! For more tips on growing your email list, see my posts 10 Ninja List Building Secrets to Grow Your List Fast and 9 Quick and Easy Ways to Build a List of Responsive Prospects FAST. What strategies do you use to get your Facebook fans to sign up for your list? Do you find it a struggle to convince your fans to sign up? Share with us below and we’ll see if we can help! Great post, Kim! It’s been a struggle for me to get people to sign up for my newsletter. I love your idea of a giveaway and contest. I’m going to try those. I have the opt in page on Facebook, but no success there. The best result I’ve had is people signing up for my newsletter after they’ve met me at a book signing. That’s where I’ve gotten a majority of my fans. I’m working on more speaking engagements through the local libraries, etc. and starting podcast series to connect with a different audience. Growing my readership is my next goal, so I like the idea of adding a dedicated “connect” with me page on my blog. Helpful post as always Kim. Do you have any stats on retention from contests & giveaways? There are a lot of freebie seekers in the world, and for a person building a business, qualified subscribers is more important than list size, I would think. 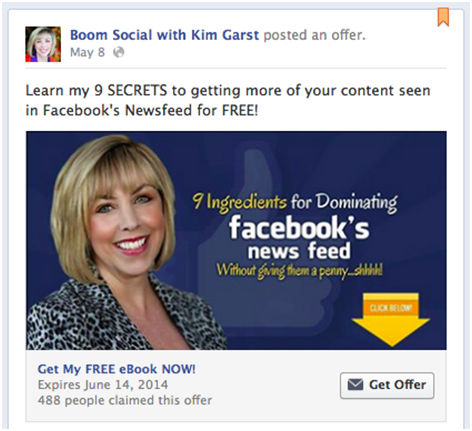 These are great ideas Kim to entice people to subscribe to a FanPage. Another task to put down on my list and implement. I can see why you have such a big following, always providing value. Thanks Kim :). Great ideas Kim. I haven’t tried any giveaways thus far. Thanks for these great tips. I need to work on bringing my Facebook fans over to my email list. Something to work on this month. Hey Kim, I really impressed with this article. It’s informative and helpful too. This shows me the ways to optimize my fan page. I liked the idea of ‘Integrate Your Email Service With Your Facebook Page’. This way i can increase the number of subscribers and grow my list. Thank you so much for such a great tips. Great post Kim. As someone who is just building my list I am really working to see find ways I can get fans to my website. I tried a Heyo contest last month, but didn’t get good results. That being said I will be trying 2 more in June. Great tips! I especially like the “promote an offer.” Thanks! This is a really helpful article. We are just getting started with strategic social media marketing plans and all the tips we can get are great. Thank you so much for the info! !